What are Complex Systems Analyses? How Can Complex System Analyses and Complexity-Awareness Support Megafauna Conservation in a Fisheries Bycatch Context? Conservation of marine megafauna is nested within an intricate tapestry of multiple ocean resource uses which are, in turn, embedded in a dynamic and complex ecological ocean system that varies and shifts across a wide range of spatial and temporal scales. Marine megafauna conservation is often further complicated by contemporaneous, and sometimes competing, social, economic, and ecological factors and related management objectives. Advances in emerging technologies and applications, such as remotely-sensed oceanographic data, animal-based telemetry, novel computational analyses, innovations in structured decision making, and stakeholder engagement and policy are supporting complex systems and complexity-aware approaches to megafauna conservation and research. Here we discuss several applications that focus on megafauna fisheries bycatch and exemplify how complex systems and complexity-aware approaches that inherently acknowledge and account for the complexity of ocean systems can advance megafauna conservation and research. Emerging technologies, applications and approaches that embrace, rather than ignore, complexity can drive innovation and success in megafauna conservation and research. Marine megafauna, which we define as large-bodied, ocean dwellers like sea turtles, seabirds, marine mammals, and sharks, have experienced dramatic declines in many ocean regions (Davidson et al., 2012; Paleczny et al., 2015). The conservation of marine megafauna populations worldwide is challenged by a suite of pressures, many stemming directly from human activity, including incidental capture in fisheries or bycatch (Lewison et al., 2014), shipping strikes (Kraus et al., 2005; Panigada et al., 2006), direct harvest (Clapham, 2015; Fisher, 2016; Hofman, 2016), and contaminant exposure and accumulation (Law, 2014). In response to these pressures, research, policy, and education or conservation awareness campaigns regarding marine megafauna conservation issues have increased considerably (Authier et al., 2017). However, while megafauna research, conservation policies, and education efforts have produced important results (Taylor et al., 2000; Boyd et al., 2016; Morin et al., 2016), we suggest that many efforts have yet to adequately embrace the complexity of the systems in which marine megafauna reside. Given the mounting pressure on ocean resources and the growing concerns regarding marine megafauna conservation (National Academy of Sciences, 2017), failing to acknowledge and account for this inherent complexity may hinder much needed advances and success in marine megafauna research and conservation. Complex systems approaches are not a single type of analyses, rather they are a diverse suite of conceptual, analytical, and computational methodologies that can be applied to “wicked” or unstructured problems (Jentoft and Chuenpagdee, 2009; Balint et al., 2011). To understand how complex systems approaches can support megafauna conservation and research, we must first define complex systems and complex system analyses. A complex system is one with a high number and diversity of interacting components or elements (Levin, 1999; Green et al., 2005). Complexity in natural systems arises when the system is influenced by multiple processes operating at disparate spatial and temporal scales—as is the case for ocean systems and many of the processes within them. Originating, in part, from general systems theory (Bertalanffy, 1968; Warren et al., 1998), complex system analysis focuses on capturing the linked and often reciprocal nature of a system's heterogeneous elements (Arthur, 1999; Manson, 2001; Strogatz, 2001; Levin et al., 2012). A complex systems approach contrasts to a reductionist scientific approach which assumes complex, dynamic, emergent phenomena can be described in terms of their individual, constituent parts and their interactions. Complexity can be measured in many forms, including non-linearity, multi-element feedback loops, path-dependence, self-organization, difficulty of prediction, and emergence of qualities not analytically tractable from system components and their attributes alone (Manson, 2001; Bankes, 2002; National Research Council, 2012). Methods and techniques of complex systems science include, but are not limited to, nonlinear dynamic analysis, cellular automata, agent-based modeling, information and network theory, and machine learning (Shalizi, 2006). Technological and computational advances have increased the tractability of complex system approaches (Levin et al., 1997; Green et al., 2005) and in some ocean research domains, like fisheries science and fisheries policy, complex systems analyses have been adopted to some degree (Wilson et al., 1994; Knowlton, 2004; Anderson et al., 2008; Mahon et al., 2008; Glaser et al., 2013). Although less commonly applied to marine megafauna, studies that have embraced true complex system approaches highlight the utility of embracing complexity. For example, Agent Based Models (ABMs) that simulate the actions and interactions of autonomous agents have been used to successfully evaluate individual decision strategies of boat users in whale watching operations and how these collectively impact local whale populations in the St. Lawrence river, Canada (Anwar et al., 2007) and more recently to investigate optimal strategies for the monitoring of green turtle (Chelonia mydas) populations in Hawaii (Piacenza et al., 2017). Machine learning methods have been used to help devise complex models and algorithms for prediction to classify probable behaviors and to estimate habitat areas of importance in seabird populations (Guilford et al., 2009; Fox et al., 2017) whilst artificial neural networks that identify patterns through unguided simulations have been used to evaluate breeding habitat suitability for New Zealand fur seals (Arctocephalus forsteri) (Bradshaw et al., 2002). Finally, a number of recent advances have been made in understanding marine megafauna behavior by addressing the dynamic state space of behavior and by developing big-data approaches that require no “a priori” assumptions about the behaviors of study animals (Beyer et al., 2013). Other examples include the use of Stochastic Dynamic Programming (SDP) and state-dependent behavioral theory to investigate how disturbance affects pinniped pup recruitment (McHuron et al., 2017), a dynamic state model of blue whale migratory behavior and physiology to explore the effects of perturbations on reproductive success (Balaenoptera musculus) (Pirotta et al., 2018), and a study of tagged southern elephant seals (Mirounga leonina) that identifies intrinsic drivers of movement, to describe the migratory and foraging habitats (Rodríguez et al., 2017). State space models have also been used to characterize dynamic movement of sea turtles (Jonsen et al., 2007; Bailey et al., 2008), seabirds (Dean et al., 2013), other marine mammal species (Moore and Barlow, 2011), and sharks (Block et al., 2011). One common feature of the examples of traditional complex system analyses is data richness, i.e., traditional complex systems analyses are data intensive. For this reason, a strictly defined complex systems approach may be challenging for many data limited ocean megafauna research and conservation efforts (Pott and Wiedenfeld, 2017). However, we suggest that even when data availability may limit the application of traditional complex system analyses, adopting complexity-aware approaches that acknowledge and strive to account for system complexity and adopt the fundamental precepts of complexity will be instrumental in advancing megafauna conservation and research. The term complexity-aware has been used in computing and computer science since the early 1990's (Mukherjee and van der Schaar, 2005). Outside of computer science, the concept of complexity-awareness has more recently been adopted in the context of social change, participatory research and project management by the non-governmental organization community (Paludan, 2015; US AID, 2016). Complexity-awareness acknowledges the prevalence and importance of non-linear, unpredictable interrelationships, non-linear causality and emergent properties, in essence, the tenets of a complex systems approach. While the term complexity-awareness has not yet been widely adopted in marine megafauna conservation or the natural resource community, calls to increase and maintain complexity in ecological research and conservation efforts are growing (Crowder and Norse, 2008; Anand et al., 2010; Stirling, 2010; Parrott and Meyer, 2012; Howarth et al., 2013; Evans et al., 2017; Johnson and Lidstrom, 2018). Much of this growing body of literature articulates how complexity and complexity-aware frameworks and analyses can be adopted and applied in conservation science, affirming the need to incorporate complexity into the conservation science landscape, particularly in response to the growing threats and stressors on coupled ecological-human systems. 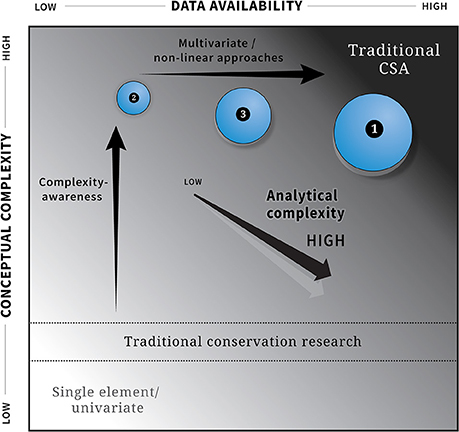 Figure 1 captures this concept and illustrates the complexity landscape as a function of data availability (x axis), conceptual complexity (y axis), and analytical complexity (z axis). While traditional complex systems analyses will be data intensive and typically include a high level of analytical and conceptual complexity, even data-poor applications can adopt a high degree of conceptual complexity and be complexity-aware. Figure 1. The three dimensional complexity landscape represented by three axes: (a) data availability (x-axis), (b) conceptual complexity (y-axis), (c) analytical complexity (z-axis), where circle size denotes analytical complexity (larger circles represent higher analytical complexity). Traditional Complex System Analyses (CSA) are possible when conceptual complexity, analytical complexity and data availability are high. As conceptual complexity increases, an analysis or application becomes complexity-aware even when data availability or analytical complexity are low. The three examples discussed in the text (1) dynamic ocean management, (2) spatially-explicit risk assessment and (3) the integration of complexity into economic and social domains are shown relative to these three axes. We illustrate complex systems analyses and complexity-aware approaches in the context of fisheries bycatch, one of the most significant anthropogenic threats to marine megafauna (Lewison et al., 2014). Fisheries bycatch, the incidental capture of unwanted, unused, or unmanaged non-target species (Davies et al., 2009), is symptomatic of one of the central challenges to ocean fisheries—how to balance ecological sustainability with economic and social viability. Megafauna bycatch is a product of susceptibility driven by the distribution, type, and magnitude of fisheries effort, and vulnerability based on ecological characteristics such as life history and species distribution traits of the bycatch species (Lewison et al., 2014). For some megafauna species, such as Pacific leatherback turtle (Dermochelys coriacea), Amsterdam Albatross (Diomedea amsterdamensis), vaquita (Phocoena sinus), Atlantic humpbacked dolphin (Sousa teuszii), and Australian and New Zealand sea lion (Neophoca cinerea and Phocarctos hookeri), fisheries bycatch has been identified as the single largest threat to extant populations (Weimerskirch et al., 1987; Lewison et al., 2004; Chilvers, 2008; Weir et al., 2011; Hamer et al., 2013; Taylor et al., 2016). In the past decade, research and development of gear and fishing practice modifications have advanced considerably and have made important progress in reducing megafauna bycatch. For some coastal drift and gillnet fisheries, deployment of visual or acoustic deterrents has been shown to substantially reduce seabird bycatch (Melvin et al., 1999; Maree et al., 2014), while acoustic alarms (pingers) have been demonstrated to decrease bycatch for multiple marine mammal species (Dawson et al., 1998; Barlow and Cameron, 2003; Carretta and Barlow, 2011; Mangel et al., 2013; Larsen and Eigaard, 2014), and buoyless nets have been found to reduce sea turtle bycatch (Peckham et al., 2016). The use of turtle exclusion devices (TEDs) can also be highly effective in reducing sea turtle bycatch in trawl fisheries (Crowder et al., 1994; Lewison et al., 2003) as can the simple use of net lights in small scale gillnet fisheries (Ortiz et al., 2016; Virgili et al., 2017). The implementation of circle hooks, alternate baits and bird scaring devices and improved setting practices in longline fisheries has been shown across multiple studies to reduce bycatch of sea turtles and seabirds as well as sharks and other non-target fishes (Gilman et al., 2005, 2007; Watson et al., 2005; Kerstetter and Graves, 2006). A number of these gear modifications have also increased survival rates for animals that are caught and released. Despite bycatch mitigation innovations and advances, bycatch of megafauna remains a substantial challenge to population viability largely because addressing bycatch is an inherently complex problem. This complexity stems from the need to balance the benefits of bycatch reduction against the costs of altered fishing activity to fishers' livelihoods and culture. In addition, the diversity among the regulatory, logistical, and socio-cultural constraints that create complex context dependencies influencing bycatch reduction efficacy needs careful consideration. Further, complexity associated with data collection, integration, and analysis, and the complex nature of the dynamic ocean itself, with macro-, meso-, and micro-scale temporal and spatial variability in ocean structure, processes and species distributions all must be considered (Hazen et al., 2013). Here, we describe several approaches that address megafauna fisheries bycatch by embracing complex system and complexity-aware analyses or frameworks. Dynamic ocean management (DOM) is an example of a complex systems approach that can support or supplement traditional management strategies to support sustainable fishery targets. DOM is an emerging management paradigm in which management responses change in space and time, at scales relevant for animal movement and human use. What differentiates DOM from static or traditional ocean management approaches is the use of real-time or near real-time data on the shifting physical, biological, socioeconomic, and other characteristics of the ocean and ocean resource users to generate responsive spatial management measures or strategies (Maxwell et al., 2012; Hobday and Hartog, 2014; Lewison et al., 2015). DOM holds promise for bycatch reduction, protected area design (Dunn et al., 2016) and management of populations of highly migratory and protected marine megafauna (Maxwell et al., 2015) because it integrates biological, ecological, environmental, and socioeconomic data collected over multiple spatiotemporal scales to provide information to managers and resource users in near real time (Hobday et al., 2014; Lewison et al., 2015). While not all DOM approaches adopt traditional complex system approaches, many employ complex systems and complexity-aware ecological informatic or eco-informatics approaches (sensu Hobday et al., 2010; Scales et al., 2017; Brodie et al., 2018; Hazen et al., 2018). These cited examples use innovative digital approaches to the generation, sampling, processing, analysis, visualization, management, and dissemination of ecological, environmental, and socioeconomic data (Michener and Jones, 2012) and account for complexity at a number of levels. Central to these applications is the capacity to acknowledge complex, often non-linear and emergent, relationships between oceanographic and biological data using species distribution models (Elith and Leathwick, 2009; Žydelis et al., 2011; McGowan et al., 2013; Becker et al., 2014, 2016; Hobday et al., 2014), often using complex ocean circulation models. Rapid developments in ocean modeling have supported the integration of species distribution models with Regional Ocean Modeling Systems (ROMS), a family of models that use free-surface, hydrostatic, primitive equations over varying topography (Wang et al., 2016). Complex or complexity-aware DOM applications have been developed to reduce sea turtle bycatch in US Hawaiian fisheries (Howell et al., 2008, 2015), avoid sturgeon-fisheries interaction in the Atlantic (Breece et al., 2017), reduce bluefin tuna bycatch in Eastern Australia (Hobday et al., 2010, 2011), and limit megafauna bycatch in the US West Coast swordfish fishery (Scales et al., 2017; Hazen et al., 2018). In coastal fishing zones, resource managers, and planners have the challenging task of balancing ecological, conservation, socioeconomic, and cultural objectives. To protect marine megafauna while supporting fisheries, managers are often asked to map, measure, and monitor the relative and cumulative risks to megafauna, with fisheries bycatch as one of the primary risks. This is particularly challenging in developing countries where managers contend with the need to support local livelihoods, paucity of available data, incongruencies across spatial and temporal scales of available information and often meager monitoring budgets. Accurately characterizing risks to megafauna, and identifying opportunities to reduce bycatch, requires an approach that accounts for the complex relationship between humans and ocean systems. New methods to investigate cumulative impacts of human activities (Halpern et al., 2008; Worm et al., 2009) and drivers of ecosystem risk in marine systems (Patrick et al., 2010; Hobday et al., 2011; Williams et al., 2011) have led to the development of risk-based scenario assessment tools, a complexity-aware approach that uses existing data and knowledge to evaluate the direct effects of human activities, climate change, and other stressors on natural resource conservation and management. Many applications of spatially-explicit risk assessment are driven and implemented by stakeholders, managers, and policy-makers needing a roadmap to understand the complexity of coastal and ocean systems, often in low capacity, data poor settings. Spatial risk assessment aims to synthesize and integrate primary data, literature reviews, expert opinion and other local knowledge in a transparent manner. Common examples of spatiotemporal risk assessment are bivariate analyses that include exposure of a habitat or species to a stressor and some metric for consequence and recovery potential, and the ability of a habitat or species to resist the stressor and recover following exposure. To account for uncertainty or missing data, these assessments can include variable weighting structure and data quality ratings, e.g., weighted averages, to acknowledge data limitations and account for uncertainty. Even in the face of data and capacity gaps, spatially-explicit risk assessments enable users to apply existing information to guide, inform, and identify appropriate survey methods, equipment and strata, establish baselines (Long et al., 2017), focus effort and resources in at-risk areas for the purpose of monitoring fisheries and marine megafauna, and evaluate alternative management scenarios that reduce risk to threatened populations (Henrichs et al., 2010). Recent applications of tools for spatially-explicit risk assessment demonstrate the importance and utility of this complexity-aware approach in both data rich and data poor contexts (e.g., Guerry et al., 2012). Spatially-explicit risk assessments have been used to support conservation of habitats in coastal Belize (Arkema et al., 2014; Verutes et al., 2017), marine and terrestrial fauna in Washington state, USA (Samhouri and Levin, 2012; Duggan et al., 2017), freshwater lenses (aquifer) in The Bahamas (Holding and Allen, 2014), and dugongs (Dugong dugon) in Sabah, Malaysia (Briscoe et al., 2014). In Belize, the InVEST habitat risk assessment model (naturalcapitalproject.org) is a spatial risk assessment tool that was applied as part of a coastal zoning process where risk to habitats was used to alter inputs to ecological production functions in mechanistic complex, process-based models of spiny lobster catch and revenue, tourism visitation and expenditures, and natural protection provided by coastal habitats during storms (Arkema et al., 2015; Guannel et al., 2016). Inspired by InVEST, a new spatial tool has been developed to evaluate fisheries bycatch risk and support marine megafauna conservation in developing countries, called ByRA (mmbycatchtoolbox.org). ByRA couples available information about the locations of megafauna with fishing effort categorized by gear type. ByRA outputs are spatially and temporally explicit, utilize existing data sources (e.g., Ponnampalam et al., 2014; Peter et al., 2016), community perspectives, and the human dimension of marine megafauna conservation (Hines et al., 2005; Teh et al., 2015). To date, the tool has been applied for the endangered Irrawaddy dolphins (Orcaella brevirostris) and dugongs (IUCN, 2017a,b) in Malaysia, Vietnam, and Thailand as the implementation of a new trade policy looms for these and other nations that currently export wild-caught seafood to the United States (Williams et al., 2016; Johnson et al., 2017). As the spatially-explicit risk assessment and structured decision-making tools illustrate, the complexity of fisheries bycatch extends far beyond biological or ecological factors (Lotze et al., 2017). Bycatch of marine megafauna is also defined by their social, economic, and political contexts (Lewison et al., 2011; Bisack and Magnusson, 2016). Integrating the economic factors and dimensions of bycatch into ecology-focused studies illustrates one key example of supporting complexity-awareness, moving bycatch from a one-dimensional (ecological) to a two-dimensional domain (ecological-economic). While there has been some integration of ecological bycatch research and socioeconomic relevant factors, e.g., calculations of potential biological removal (PBR) are an obvious example of this (Lobo et al., 2010; Jin, 2012; Little et al., 2014; Abbott et al., 2015), socioeconomic considerations of bycatch are often overlooked in the marine megafauna conservation literature (Lent, 2015; Barnes et al., 2016; Alava et al., 2017; Lent and Squires, 2017; Lotze et al., 2017; van Beest et al., 2017). Economic approaches to megafauna bycatch reductions are limited by data gaps, limited understanding of their effectiveness (Lent and Squires, 2017) and the difficulty of integrating economic valuation functions with ecological production functions (Tschirhart, 2011). One effort to integrate economics and endangered Stellar sea lion (Eumetopias jubatus) bycatch demonstrates the utility of integrated, complexity-aware approaches to bycatch (Finnoff and Tschirhart, 2008). Using economic and ecological dynamic general equilibrium models and applying economic principles such as rational behavior, efficiency, and equilibrium to ecosystem processes, integrated models were used to assess the impact of alternative quotas in a local pollock (Gadus chalcogrammus) fishery on eight bycatch species including otters (Enhydra lutris), killer whales (Orca orcinus), and Stellar sea lions. Related analyses also consider the effects of the pollock fishery on the non-consumptive use of these marine mammals (Finnoff and Tschirhart, 2003b). By embracing the linked economic-ecological complexity in fisheries bycatch, these integrated approaches demonstrate the ability of complexity-aware bycatch analyses to capture the key interactions and trade-offs between target catch and at-risk megafauna populations (Finnoff and Tschirhart, 2003a), and serve as a framework for how to also incorporate linked social or political factors that can strongly influence megafauna bycatch. Embracing complexity is equally important outside the scientific community as a part of stakeholder engagement, education and awareness. Because stakeholder groups are the backbone of marine megafauna conservation and support for research (Fulton et al., 2015), stakeholder awareness of the interdependencies and inherent complexities of the megafauna conservation landscape is an essential ingredient to effective conservation (Prell et al., 2009). Although not specific to marine megafauna conservation, Q-methods, participatory mapping and collaborative learning methods are examples of approaches that have been used to help “unpack” complexity surrounding natural resource management and use (Davies et al., 2016; Hagan and Williams, 2016; Niedziałkowski et al., 2018). These methods can clarify and map viewpoints and perspectives of different stakeholder groups without bias, helping to articulate the potentially competing interests of the fishing industry and the marine megafauna conservation community (Prell et al., 2009; Forrester et al., 2015). Complexity and complexity-awareness is also essential to consumer education and engagement particularly in the context of fisheries, and the co-creation of knowledge among stakeholder groups has been used to support complexity-aware approaches to education and outreach (Steyaert and Jiggins, 2007). Eco-labeling and certification standards, like SeaFood Watch (http://www.seafoodwatch.org/), RASS (http://www.seafish.org/rass/), or MSC (http://www.msc.org/) can help seafood consumers deal with complex market and supply chains and support effective megafauna conservation as well as reinforce corporate social responsibility commitments (Gutierrez and Thornton, 2014; Caveen et al., 2017; Lent and Squires, 2017). These complexity-aware education approaches allow consumers to move beyond a “not in my backyard” perspective to support meaningful megafauna conservation and sustainable fisheries across intricate, connected global market chains. Understanding how complexity affects policies that govern bycatch will also be an important aspect to embracing complexity in marine megafauna conservation (Hirsch et al., 2010; Whitty, 2015). Policy approaches that explore policy pathways, such as the Pragmatic Enlightened Model (Edenhofer and Kowarsch, 2015), can help policy-makers understand what varying levels of complexity mean across the tradeoffs and practical consequences of each pathway. A better understanding and integration of complexity into a policy context will also help to strengthen policy development and implementation (Paul Cairney, 2017). Complexity-aware policies are ones that account for the diversity of resource stakeholders, and the reality of multiple resource uses across the seascape (Sayer et al., 2013). The conservation of marine megafauna, in particular, requires policy and governance structures that acknowledge the migratory nature of many megafauna species of conservation concern. Protection of important breeding or feeding grounds within one jurisdiction may prove to be necessary but not sufficient to conservation efforts if sensitive life stages move among unprotected waters, whether intra- or international. Policies that inherently recognize the complex relationships among ecological, social and economic systems and the influence these relationships can have on policy outcomes across jurisdictions can also ensure that well-intentioned megafauna conservation policies do not displace, and in some cases magnify, marine megafauna bycatch, or different risks in other jurisdictions (Lenzen et al., 2012; Lim et al., 2017). Approaches that embrace complexity often improve the accuracy of how systems are represented and understood. Greater complexity is, however, also commonly associated with increased uncertainty that is borne from the addition of parameters which each have their own uncertainties associated with them (Fulton et al., 2003; Low-Décarie et al., 2014; Winkler, 2016). Conservation practitioners must therefore weigh the benefits of using simplified frameworks alongside more complex approaches. For all conservation applications and frameworks, there will be a fundamental and common challenge of how to balance system complexity while minimizing uncertainty (Collie et al., 2014). In fisheries science, attempts to strike this balance have led to the development of Models of Intermediate Complexity for Ecosystem assessments, or MICE (Plagányi et al., 2014). The MICE approach selects model complexity based on a specific problem statement and the data available, with temporal scales to match the questions being addressed (Essington and Plaganyi, 2013). The MICE approach for strategic complexity integration in fisheries research serves as a useful model for how to increase complexity while limiting sources of uncertainty in megafauna conservation and research efforts. Other fisheries-focused initiatives that attempt to recognize the inherently complex nature of ocean management include the concepts of Ecosystem Based Fisheries Management (EBFM) and Integrated Ecosystem Assessments (IEA), which aim to sustain healthy marine ecosystems and the fisheries they support by accounting for ecosystem complexity and the holistic impact of management decisions on those systems (Pickitch et al., 2004; Levin et al., 2009). Compared to more traditional, single species-based approaches to fisheries management, both EBFM and IEA represent how fisheries science has moved toward complexity and complexity-awareness (Marshak et al., 2017). However, the well-described shortcomings with the implementation of EBFM and IEA (Longhurst, 2006; Shelton, 2007; Borgström et al., 2015; Dolan et al., 2016) highlight the challenges that complex approaches in megafauna research and conservation will likely face in operationalizing and implementing complexity in a measurable and meaningful way. Given the complex ecological, environmental, socioeconomic, and cultural dimensions that govern ocean systems, and thus megafauna conservation, the need for complex systems analyses or complexity-aware approaches will likely not come as a surprise to most readers of this special issue. While research and conservation methods that have approached megafauna conservation from a single element or domain perspective have yielded important insights and accomplishments, as the conservation status of many marine megafauna worsens (Davidson et al., 2012; Paleczny et al., 2015), there is a pressing need to embrace the complexity that governs marine megafauna and the systems in which they reside. Even in the face of limited data and uncertainties, adopting complex systems and complexity-aware approaches to resource management, marine spatial planning and resource and marine policy and education provides a more realistic lens for conservation and research efforts. The need to view the conservation landscape as a complex system and calls for a “conceptual revolution” in how we approach marine megafauna conservation and research echo similar calls to infuse complexity into other conservation-related domains (Blaustein and Kiesecker, 2002; Parrott and Meyer, 2012; Lash-Marshall, 2013). By accepting that innovation and effective action in megafauna research and conservation means embracing complexity, and avoiding oversimplification sensu Stirling (2010), the marine megafauna research and conservation community is poised to focus on identifying levels of complexity that are needed to characterize and understand patterns of interest in time and space, and drive real world change. By embracing the inherent complexity of marine systems, conservation scientists and practitioners will be better equipped to provide actionable analyses, data, and information which can be used to protect and conserve megafauna. RL was supported in part by NASA Earth Science Division/Applied Sciences Program's ROSES-2012 Ecological Forecasting grant (NNH12ZDA001N-COF). AJ was supported by National Science Foundation grant DEB-1632648 (2017/2018). Focus for this paper was conceived at the California Leatherback Day Celebration, Southwest Fisheries Science Center, October 2016. Alava, J. J., Tatar, B., Barragán, M. J., Castro, C., Rosero, P., Denkinger, J., et al. (2017). Mitigating cetacean bycatch in coastal Ecuador_ Governance challenges for small-scale fisheries. Mar. Policy. doi: 10.1016/j.marpol.2017.05.025. [Epub ahead of print]. Balint, P. J., Stewart, R. E., Desai, A., and Walters, L. (2011). Wicked Environmental Problems: Managing Uncertainty and Conflict. Washington, DC: Island Press. Bertalanffy, L. V. (1968). General System Theory: Foundations, Development, Applications. New York, NY: George Braziller. Guilford, T., Meade, J., Willis, J., Phillips, R. A., Boyle, D., Roberts, S., et al. (2009). Migration and stopover in a small pelagic seabird, the Manx shearwater Puffinus puffinus: insights from machine learning. Proc. R. Soc. B: Biol. Sci. 276, 1215–1223. doi: 10.1098/rspb.2008.1577. Henrichs, T., Zurek, M., Eickhout, B., Kok, K., Raudsepp-Hearne, C., Ribeiro, T., et al. (2010). Ecosystems and Human Well-Being: A Manual for Assessment practitioners. Washington, DC: Island Press. IUCN (2017a). Dugong dugon: Marsh, H. and Sobtzick, S.
IUCN (2017b). Orcaella brevirostris: Minton, G., Smith, B.D., Braulik, G.T., Kreb, D., Sutaria, D. and Reeves, R.
Johnson, A.F., and Lidström, S. (2018). The balance between concepts and complexity in ecology. Nat. Ecol. Evol. 2, 585–587. Lash-Marshall, W. G. (2013). Embracing Complexity in Conservation Theory and Practice. State University of New York. Levin, S. (1999). Fragile Dominion: Complexity and the Commons. New York, NY: Perseus Books. Mukherjee, D., and van der Schaar, M. (2005). “Compact dependent key generation methods for encryption-based subscription differentiation for scalable bit-streams” in IEEE (Genova), II–1114. National Academy of Sciences, Engineering and Medicine. (2017). Approaches to Understanding the Cumulative Effects of Stressors on Marine Mammals. Washington, DC:The National Academies Press. National Research Council (2012). Assessing the Reliability of Complex Models: Mathematical and Statistical Foundations of Verification, Validation, and Uncertainty Quantification. National Academies of sciences, engineering and medicine. Peter, C., Zulkifli, A. N., Ngeian, J., Tuen, A. A., and Minton, G. (2016). Identifying Habitat Characteristics and Critical Areas for Irrawaddy Dolphin, Orcaella brevirostris: Implications for Conservation, eds. Das, I., and A. A. Tuen. Shalizi, C. R. (2006). “Methods and techniques of complex systems science: an overview,” in Complex Systems Science in Biomedicine, eds T. S. Deisboeck and J. Y. Kresh (New York, NY: Springer), 33–114. Copyright © 2018 Lewison, Johnson and Verutes. This is an open-access article distributed under the terms of the Creative Commons Attribution License (CC BY). The use, distribution or reproduction in other forums is permitted, provided the original author(s) and the copyright owner are credited and that the original publication in this journal is cited, in accordance with accepted academic practice. No use, distribution or reproduction is permitted which does not comply with these terms.